Hamas: He "gave the Zionists a taste of humiliation"
PA: Funeral was "national wedding"
The terrorist who murdered 15 in the Sbarro pizza shop suicide bombing in 2001 was given a military funeral by the PA after his body was transferred to the PA last week. On Aug. 9, 2001 suicide bomber Izz Al-Din Al-Masri detonated himself in a Sbarro pizza shop in Jerusalem, killing 15, 7 of them children. 5 members of one family were killed in the attack. (See names below.) Palestinian Media Watch has reported that the PA in the past has honored Ahlam Tamimi, the terrorist who picked the Sbarro restaurant as the place for the bombing "because many people entered it," and later led the bomber there. Official PA TV has also glorified her. 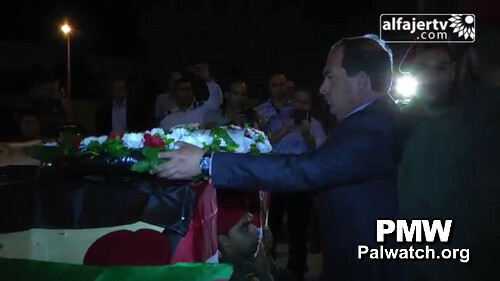 Last week, Israel transferred the body of the suicide bomber to the PA and both the PA and Hamas took the opportunity to honor the murderer once again. Reporting from the official military funeral, PA TV News called him a "Martyr," the highest religious level a Muslim can reach. In calling the terrorist a Martyr - a Shahid - the PA continues to teach its people that according to its interpretation of Islam, killers of Israeli civilians in suicide terror attacks are doing such a positive act, that it overrules the general Islamic prohibition against committing suicide. "The popular gathering around the blood of Izz Al-Din Al-Masri is an honest and true expression of our people's yearning for national unity (between Fatah and Hamas) and unity of action." Palestinian Media Watch has reported that in 2012 when bodies of 91 terrorists, including many suicide bombers, were transferred to the PA by Israel, the PA honored them as Islamic Martyrs with a military funeral. "We will never forget them, and we will always remain faithful to their vow... Oh brothers [Martyrs], your souls now hover above us and say to us: 'Follow in our path, stick to the obligation that is incumbent upon us.'" Click to see more examples of PMW's documentation of the PA, Fatah and Hamas' glorification of terrorists. PA TV reporter: "Thousands of civilians from the Tubas District, representing all segments of the political activity, took part in the funeral of the remains of the Martyr (suicide bomber who killed 15) who gave his soul for the struggle of a nation that strives for freedom." Mayor of Aqqaba Jamal Abu Ara: "The popular gathering around the blood of Izz Al-Din Al-Masri is an honest and true expression of our people's yearning for national unity (between Fatah and Hamas) and unity of action." PA TV reporter: "The flags of the political parties were raised at this national wedding (the Martyr's wedding to the 72 Virgins in Paradise), which demonstrated the national unity and cohesion among our people." Hamas TV reporter: "The Martyrdom-seeker Izz Al-Din Al-Masri (suicide bomber who killed 15) has returned victorious... He has returned to make those who loved him happy, just as he made them happy on the day he carried out his operation (suicide terror attack) 13 years ago. The return to his home in Aqqaba was a wedding worthy of ululations (the Martyr's wedding to the 72 Virgins in Paradise)..."
Suicide bomber's mother: "I congratulate him: Congratulations, my son, on your Martyrdom, praise Allah. You obtained what you sought, praise Allah..."
Hamas TV reporter: "Izz Al-Din Al-Masri ascended to Paradise in a Martyrdom-seeking operation (suicide terror attack) he carried out in the Sbarro restaurant in Jerusalem, where he gave the Zionists a taste of humiliation after killing 19 Zionists and wounding dozens... The citizens expressed their pride in Izz Al-Din's heroism, along with the thousands who gathered to accompany him on his final journey, and they did not forget all those who played a role in this operation." Hamas leader Ahmad Nimr Abu Ara: "All flee death except the Martyrdom-seeker, who pursues and seeks the Angel of Death. I salute Ahlam Tamimi, (planned Sbarro bombing) who brought Izz Al-Din to his battlefield; I salute Qais Adwan (responsible for murder of 77); I salute Abdallah Barghouti (67 life sentences); I salute Ahmed Al-Ja'abari (Hamas leader); I salute Muhammad Deif (Hamas leader), and first and foremost, I salute prisoner Jamal Abu Al-Hija (9 life sentences)." Izz Al-Din Al-Masri - suicide bomber who carried out the Aug. 9, 2001 bombing of the Sbarro pizza restaurant in Jerusalem, in which 15 civilians were killed and 130 wounded. Israel transferred the terrorist's body to the PA on April 29, 2014. Ahlam Tamimi - was serving 16 life sentences for leading a suicide bomber to the Sbarro pizza shop in Jerusalem on August 9, 2001. 15 people were murdered in the attack, 7 of them children, and 130 were injured. In October 2011, Tamimi was released as part of the Shalit prisoner exchange deal brokered between the Israeli government and Hamas. In that deal, Israel released 1,027 Palestinian prisoners in exchange for Israeli soldier Gilad Shalit, who had been held hostage by Hamas for more than 5 years. Qais Adwan - a senior member of Hamas' military wing, responsible for the deaths of 77 Israelis. He was involved in several Hamas terror attacks, including the Sbarro pizza shop suicide bombing in Jerusalem (15 killed, 130 wounded, Aug. 9, 2001), the Netanya Park Hotel suicide bombing (29 killed, 64 wounded, March 27, 2002), and the Haifa Matza Restaurant suicide bombing (16 killed, 40 wounded, March 31, 2002). He was killed by Israeli security forces in Tubas in May 2002. Abdallah Barghouti - serving 67 life sentences for preparing explosives for terror attacks in which 67 people were murdered: Sbarro restaurant (15 killed, Aug. 9, 2001), Sheffield Club (15 killed, May 7, 2002), Moment Caf? (11 killed, March 9, 2002), triple attack at Ben Yehuda pedestrian mall (11 killed, Dec. 1, 2001), Hebrew University (9 killed, July 31, 2002), and Bus 4 in Tel Aviv (6 killed, Sept. 19, 2002). Ahmed Al-Ja'abari was a member of Hamas' political bureau and, beginning in 2002, the operational commander of Hamas' military wing, the Izz A-Din Al-Qassam Brigades. Israel holds him responsible for all terrorist activities against Israel from the Gaza Strip between 2002 and his death in 2012, including numerous suicide bombings that killed hundreds of Israeli civilians and soldiers. He was involved in the abduction of Israeli soldier Gilad Shalit (June 25, 2006) and in the negotiations surrounding Shalit's release in October 2011. Al-Ja'abari played a leading role in the Hamas takeover of the Gaza Strip in June 2007. He was killed in an Israeli airstrike on Nov. 14, 2012. Muhammad Deif - commander of Hamas' military wing, the Izz A-Din Al-Qassam Brigades. He organized several terror attacks, including the first Jaffa Street suicide bombing in Jerusalem (27 killed, 35 wounded, Feb. 25, 1996), the second Jaffa Street suicide bombing in Jerusalem (18 killed, over 40 wounded, March 3, 1996), the Ashkelon Junction suicide bombing (1 killed, 35 wounded, March 3, 1996), the Elei Sinai shooting attack (2 killed, 15 wounded, Oct. 2, 2001 and the Atzmona shooting attack (5 killed, 15 wounded, March 7, 2002). He also led the cell that kidnapped and murdered 3 Israeli soldiers: Shahar Simani (April 20, 1994), Aryeh Frankental (July 7, 1994) and Nahshon Waxman (Oct. 9, 1994). Jamal Abu Al-Hija – was the head of Hamas’ military wing in Jenin. He received 9 life sentences and 20 years for direct involvement in the Miron Junction bombing that killed 9 and injured dozens on Sept. 4, 2002. "The funeral procession of Martyr (Shahid) [Izz Al-Din] Al-Masri, who carried out the Sbarro Martyrdom-seeking (Istish'had) operation (i.e., terror attack) in West Jerusalem on Aug. 9, 2001, set out from the Turkish Government Hospital in Tubas. The District Governor added: 'Our Martyrs are not [mere] numbers in the occupation's cemeteries, but heroes who watered the pure land of Palestine with their blood. It is our duty to remain committed to the path until their dream - the establishment of the independent State of Palestine, whose capital is Jerusalem - is realized.'" Note: Palestinian families of terrorists buried in Israel have petitioned the Israeli High Court of Justice, demanding that Israel transfer the bodies of their family members. In August 2013, against the backdrop of the renewal of peace negotiations with the Palestinians, Israel informed the High Court that it was intending to transfer the bodies in any case - a process that had begun already in 2012 -, and that therefore, the families' petitions were unnecessary and there was no need for the High Court to rule on the matter.